OJ&B CO-Hosts Summer Social 2010! 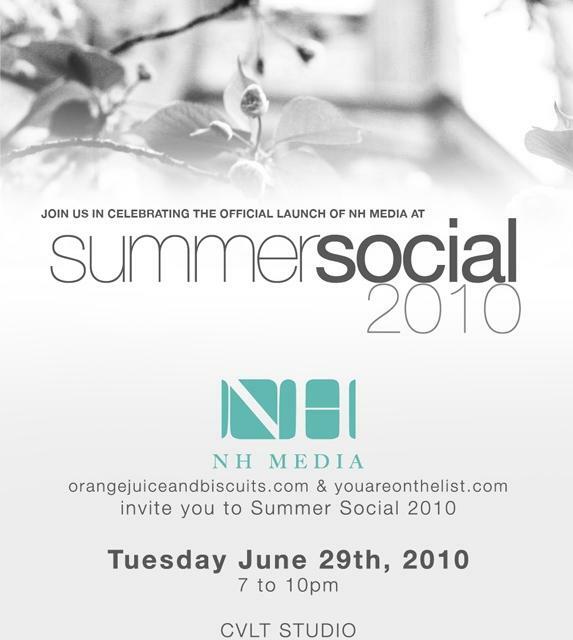 I am very proud to officially announce that OJ&B will be co-hosting Summer Social 2010 celebrating the launch of NH Media along with Youareonthelist.com. This will mark the first official event that OJ&B will be a part of in New York City and I could not be more excited to help welcome people to the NEW New York! The new age of social media and marketing has enabled bloggers, marketing/PR professionals and “tweeple” to steal the spotlight and promote trends that shape our culture and society. We call this the NEW New York. NH Media will officially launch its services on June 29th in conjunction with OrangeJuiceandBiscuits.com and YOUAREONTHELIST.com at Cult Studio, NYC from 7pm to 10pm. Summer Social will feature a fierce guest photo shoot, live twitter stream, cocktails, chocolate fountain, and of course, spectacular gift bags. Food and staffing will be provided by Q Events. Other sponsors include Cult Studios, The Boulevard Magazine, BNI, Honest Tea, 1947 Beer, Oro Tequila, The Professionals, Brazilets, One Water, Pop Chips, The Blind Project, China Glaze, Tarte Cosmetics and Jen Chu Design. Above: A HUGE Thanks to all of our sponsors for Summer Social 2010! Guests will include models, socialites, entrepreneurs, celebrities, press, influential PR professionals in the fashion and entertainment industry and more. Guests of note will walk a step and repeat for press and let's be honest, who does not love a good step and repeat situation? NH Media is a Social Media PR firm catering to clients who want to transform their brand in the public eye by harnessing the power of social media as well as inspire companies to embrace the future of social marketing to optimize business opportunities. NH Media strives to use campaigns and events as platforms to develop partnerships and relationships with companies that empower women and children. Youareonthelist.com is a company that provides its members with the ultimate access to luxury event experiences that only insiders can attend.